David Wichs, beloved husband, brother and son, was killed by a crane collapse on Friday morning in downtown New York City. 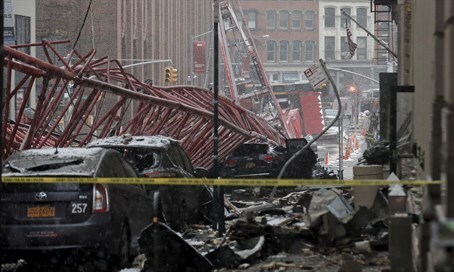 The only fatality in a crane collapse that took place in New York City on Friday has been identified as an Orthodox Jewish resident of the Upper West Side by the name of David Wichs. The collapse took place at 60 Worth Street, and police officers and EMS who responded to the scene pronounced Wichs, who was 38 years old, dead at the scene. There was no other fatality in the incident, however, two other seriously injured victims were treated on scene before being transported to hospitals in the area. According to AP "Wichs worked as an analyst for Tower Research Capital, a financial trading firm with offices in Lower Manhattan, located just two and a half blocks from the site of the deadly collapse." Wichs was the son of a Dr. Tomas Wichs, who worked as a computer scientist and his wife Dr. Adela Wichs who was a well known Borough Park pediatrician. The couple emigrated to the United States from Prague with their two sons over 20 years ago. David Wichs was a graduate of the Yeshiva of Flatbush, and went to study at Harvard university, where he served as the co-chair of the local Hillel’s Men’s Group. Wichs is survived by his wife Rebecca, whom he married just over three years ago. “He really created a life for himself. He literally took every opportunity he could find,” his sister-in-law, Lisa Guttman. told the AP.